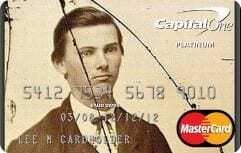 Last week Capital One Bank approved the image of Jesse James for the face of the MasterCard of Eric James, president of The James Preservation Trust. This image never has been published before. The original full image of Jesse will be published for the first time on the book cover of Eric’s new book about the Jesse James family Jesse James Soul Liberty, Behind His Family Heritage of Stigma & Silence. To encourage additional pledges, The James Preservation Trust will now make this previously unpublished image of Jesse James available to anyone who registers a pledge of $25 or more, or who increases an existing pledge, between now and July 30, 2011. When the funding goal is successfully achieved, those who pledge will receive the image of Jesse James to put on their credit cards, together with the Rewards offered by the pledge amount selected. Make your pledge today on Kickstarter.com . Put Jesse James on your bank credit card. And put Jesse James Soul Liberty and the history of the Jesse James family on the shelves of America’s bookstores and libraries.